Our newly renovated and expanded Emergency Department offers you and your family the latest in technology, maximum efficiency and decreased waiting time, along with the compassionate care for which Good Samaritan Hospital has long been known. Our emergency helicopter landing zone allows patients to be quickly airlifted to our trauma center. Patients enter the Emergency Department through our spacious protected receiving area. Our Emergency Specialists are ready 24 hours a day. Our highly trained and specialized in-house Emergency Department staff - which includes board certified physicians, physician assistants and experienced emergency nursing staff with certifications in emergency care - are always available to help you. Nursing staff members are qualified to provide complete emergency and trauma care for children and adults and have education in Advanced Cardiac Life Support, Pediatric Advanced Life Support and Trauma. Our "Fast Track" assures prompt treatment if you need immediate, not emergency, medical care. If you need services for non-life-threatening injuries or illnesses, such as sprains and fractures, colds or flu, you can usually be examined and treated more quickly in the Fast Track area of the Emergency Department. The Chest Pain Center is a special area of the Emergency Department designed to quickly handle patients arriving with chest pain. You will receive emergency diagnostic and urgent care to determine if the cause of your chest pain is cardiac induced, respiratory or from another source. The Center provides rapid assessment and diagnosis to determine if a heart attack has occurred or is in progress and to ensure immediate implementation of appropriate medical care. The Triage System ensures immediate treatment for critically ill patients. The standard Triage System established in Good Samaritan Hospital's Emergency Department is designed to identify patients with the most severe injuries or illnesses and ensure that these patients receive treatment immediately. Unless you need to be treated immediately, Emergency Department patients are first seen in the Triage area, where a registered nurse will complete an assessment of your illness or injury. The registration staff then registers you by recording your name, address, identification and health coverage information. The staff will direct you to a treatment room or the waiting area depending on the nature of the illness or injury. Patients that are critically ill or injured are immediately brought into an Emergency Department treatment room. Good Samaritan Hospital, a member of the Westchester Medical Center Health Network (WMCHealth), is home to the region's ONLY dedicated Obstetrics Emergency Department that offers expectant mothers and families high-quality, specialized labor and delivery care 24 hours a day, seven days a week. It is the only OB-ED in Rockland and Orange Counties and in the entire Hudson Valley. The Obstetrics Emergency Department, known as the OB-ED, offers labor and delivery care as an extension of Good Samaritan Hospital’s primary Emergency Department. 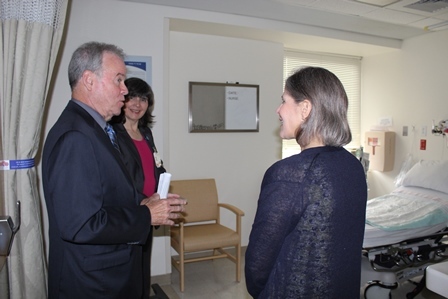 It collaborates with the Good Samaritan OB Hospitalist Program, providing pregnant women access to specially-trained physicians and nurses. 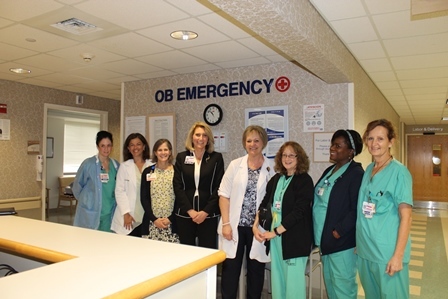 The Obstetrics (OB) Emergency Department (ED), or OB-ED, was made possible through the creation of the Good Samaritan Hospital OB Hospitalist Program, a partnership with the OB Hospitalist Group (OBHG). The program’s board-certified OB physicians are on-site, all day, every day to ensure expectant mothers receive expert care at a moment’s notice. The physicians and highly-skilled nurses are available to deliver babies if a patient's own physician is unavailable and will respond to any obstetric emergency. The OB-ED also provides a calm setting that prioritizes a patient-first culture, with dignity and sensitivity embedded in every aspect of care. The OB-ED also provides a calm setting that prioritizes a patient-first culture, with dignity and sensitivity embedded in every aspect of care.